A range of flanged cast iron fittings is available in many sizes and configurations, including all-flanged tees, flanged tails and socketed flanges. 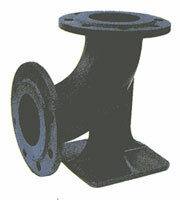 Duckfoot flanges, tapers, bends and tees are also available. Please Contact us to discuss your requirements on 01 450 8046.